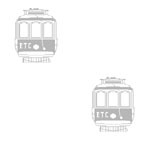 Comments: These narrow gauge hill cars are, argueably, Portland's best-known streetcars because of their long years of service. First described as "Portland Heights Closed," they eventually aquired the nickname "Council Crests," reflecting the popular line they served until the end of trolley service in Portland. 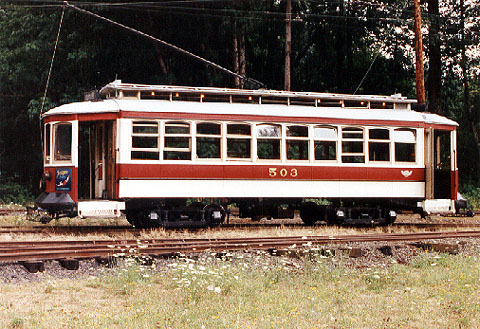 This car series was numbered 201-210 by original owner Portland Railway Co. They were built in St. Louis by J.G. Brill subsidiary American Car Co., and incorporated Brill's classic "semi-convertible" design in which barrel-shaped ceilings allowed windows to be stowed out of view in warm weather. The Council Crests were unique in other ways as well. They were the first American Car Co. products in town, and their equipment and length made them stand out from the PAYE cars that began to flood into carbarns four years later. There was only one other car series in class J (meaning 34 to 40' in length with 4 motors), the 451-465 "Torontos," which were also intended for hill work. 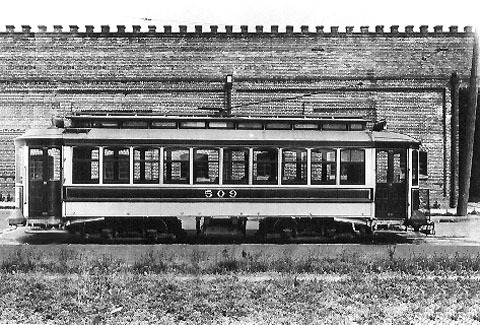 There were two very similar-looking standard gauge suburban trolleys, Sellwood Line cars 1051 and 1052. But these were two-motor cars of longer length (11 window sides instead of 10). It is unclear whether they were part of the same car order. Short, powerful, magnetic brake-equipped No. 's 501-510 replaced cable cars as the way to climb the grade to the fashionable Heights. They arrived in time to serve visitors to Oregon's only world's fair, the 1905 Lewis & Clark Exposition, and they stayed in service until the last three city lines were converted to bus in 1950. The beloved Council Crest cars' 45 year long service record resulted in them being available for preservation and, in fact, two of the ten car series are now in the Oregon Electric Railway Museum collection in Brooks, Oregon. After retirement trucks and equipment were removed from No. 503 and it was donated to a North Portland Boy Scout troop who used it as a clubhouse. During the 1960s it went to the OERHS Trolley Park in Glenwood, Oregon where it was restored to operation in 1976 using standard gauge trucks from Australia. It was put on display in downtown Portland for Tri-Met's 10th birthday party in 1980. Then, the car gained international attention when it was leased to San Francisco's Market Street Railway for participation in their Trolley Festival during two summers, 1983 and 1984. 503 was used as the test vehicle during start-up of the Willamette Shore Line from Portland, Oregon to Lake Oswego in 1986, but was returned to Glenwood when it was determined that its platforms were too weak for further heavy use. In 1991 No. 503 returned to downtown Portland for display and testing in conjunction with the startup of Portland Vintage Trolley. In 1997 CC 503 left the Trolley Park for the last time, when it moved under its own power (using a tag-along generator) to a railhead near Beaverton for shipment to the new OERHS Museum in Brooks. The other Council Crest car to escape the wrecker's torch was No. 506. 506 was put on display outside the Center Street Shops for a time after retirement. It was later donated to the Oregon Historical Society, who had it trucked to Council Crest Park for permanent display. After nearly 20 years of display near the terminus of its old line No. 506 suffered damage from Halloween vandals in 1972 and was returned to Center Street for storage. The car finally joined its sister at the Trolley Park in Glenwood in 1976 because plans were being made for demolition of the Center Street Shops (they were razed in 1978). Although not in as good a condition as No. 503, after years of display outside, No. 506 still retains its original narrow gauge trucks and running gear. It received a cosmetic exterior restoration at the Trolley Park and was later moved to the new museum in Brooks to await future overhaul. Adenda: The memory of the Council Crests lives on outside of museum restorations. In 1991 Vintage Trolley, Inc. received four Council Crest car replicas built by the Gomaco Company. These cars were numbered 511-514 in sequence after their Brill-built prototypes. They arrived in Portland during the spring and summer and went into service between Lloyd Center and downtown Portland on November 29 running over existing MAX track. Longtime Portlanders experienced a sense of deja vu seeing these CC look-alikes running along downtown Morrison Street. Retirement: All in 1950 except for No. 507, which was retired in 1944 after a vestibule was knocked off in an accident (11-30-44). See note below on No. 510. Received Nelson Safety Fenders in 1912. A 1922 field check showed snow scrappers on No. 's 504-510. No. 510 was damaged by fire while on the CC Line in 1948, and was apparently not put back into service.